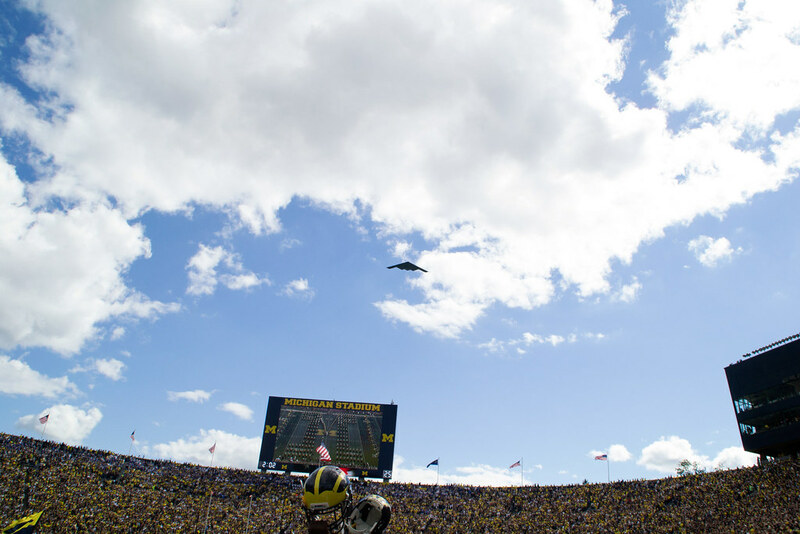 For anyone who suspected Michigan should just roll over Air Force, and I truly hope that wasn't the case, I think yesterday was probably not very much fun for folks to watch. It wasn't fun for anyone to watch. But as I heard about 1,000 times last night "A win is a win.". Yes it is. I liked playing Air Force. I liked playing a service academy. It's special and it feels different. Say what you will, this team can play. This was a good test for Michigan, and I bet they'll be a good test for the next 10 teams on their schedule. I hope their players felt Michigan fans greatly respected and admired them for their service to our country. I think they left Michigan Stadium with their heads high. And against an offense like Air Force, with small but very disciplined players who really don't make that many mistakes, that's a tough game for any team, especially one that just came home from a 41-14 pummeling in Dallas a week ago. I said last week that Air Force would move the ball well, and get "uncomfortable" amounts of rushing yards. Well, I'd say 290 is pretty uncomfortable. AF ran the ball a mind-boggling 71 times. That only amounts to about 4.1 yards per rush, but it sure felt like AF ran the ball better than that. I think it really just boiled down to Michigan not having any way to adequately prepare for an offense like that, and the high-speed tempo in which they get off plays. The chain-gang got a work out yesterday, they rarely were set after first downs. I really don't think Michigan fans should be reading too much into this game, or how the defense played. I know it sounds like I'm making excuses, but I really do feel like AF has the ability, because of their scheme, to make you just look bad at times. But why they decided to turn into a passing offense at the end of the game was the undoing of this game for Air Force. Denard had another Denard day. 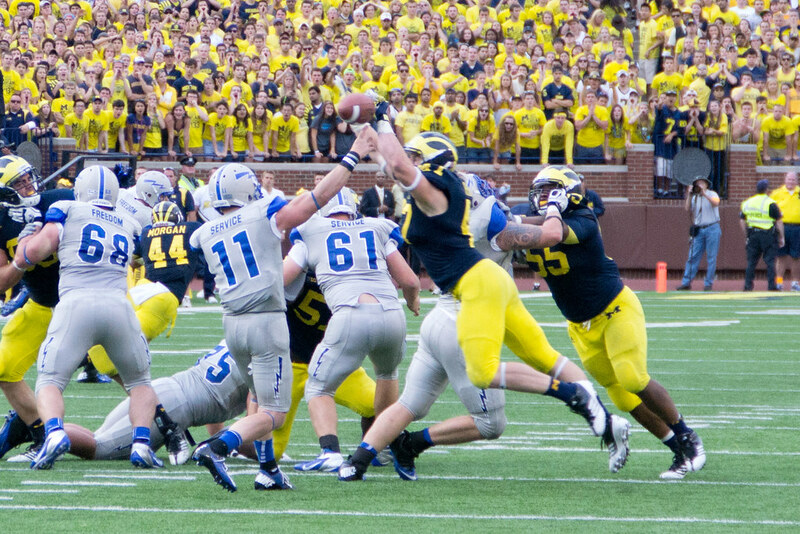 I swear he was getting some runs for about 10 yards that barely got applause from the Michigan crowd. So comfortable we have become watching this kid play on the turf of the Big House. He finished the day 14 for 25 for 208 yards, 2 TDs and 1 INT (the pick was really Gallon's fault, he should have pulled that one in). He also ran the ball like his old self, 20 carries for 218 yards and 2 touchdowns. His day was highlighted by the second play from scrimmage when he took the rock 79 yards untouched. He will be announced as B1G offensive player of the week, I assume. This is my biggest area of concern. Not the defense. This. Hoke mentioned this, and coined that phrase in the post-game presser, and put a lot of the blame squarely on the offensive line. Fitz never got started because the line never did either. Denard had a big game because he's Denard and that's what he does. But Fitz and the other backs rely on the OL to do their job and make the running lanes available. That never happened yesterday. Ryan had a banner day. He wore Oosterbaan's #47 and did him proud. He finished the day with 11 tackles, including 1 for loss. But what doesn't show up on the stat sheet is his sheer presence on the field. He was everywhere, disrupting the offense. In the post-game presser he mentioned he hasn't had the chance to meet with Oosterbaan's family, but he'd like to. I bet they would love to return the favor. Not to be outdone, Joe Bolden had a nice game when he replaced Demens in the 2nd half. If you didn't know the name Devin Funchess before yesterday, I'm sure you do now. His teammates have nicknamed him "D-Funch". The TE led all receivers with 4 catches and 106 yards and 1 touchdown grab. Gardner looked better than last week. Had 5 grabs including a touchdown. Paging Treezy. Has anyone seen Roy Roundtree? That was close. 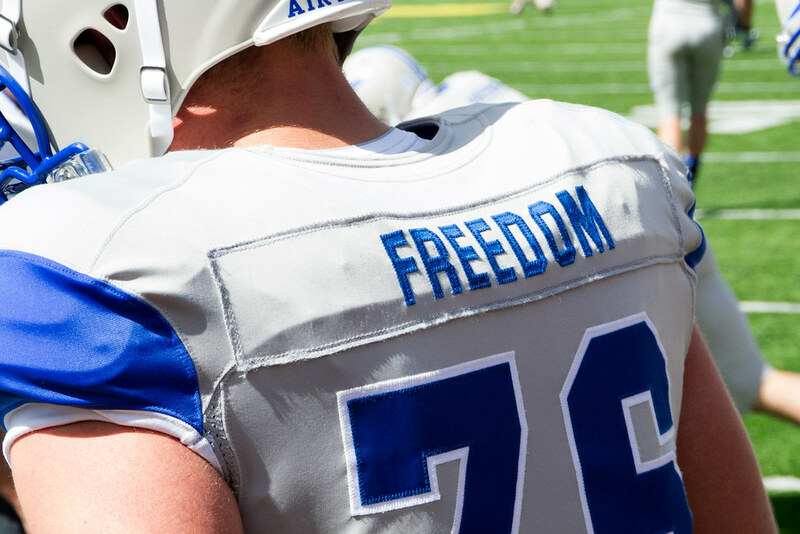 If Air Force could have done something/anything else, namely, toss it downfield more than 15 yards, or execute a fake kick, or execute a real kick, I think we’re 0 and 2. In a game that felt like something out of the Rodriguez era, Michigan showed that while there's great promise for the future, the flaws exposed by Alabama are very real. The Wolverines edged Air Force, 31-25, and the outcome wasn't decided until Jake Ryan batted down Air Force quarterback Connor Dietz's fourth-down throw with 1:28 remaining. 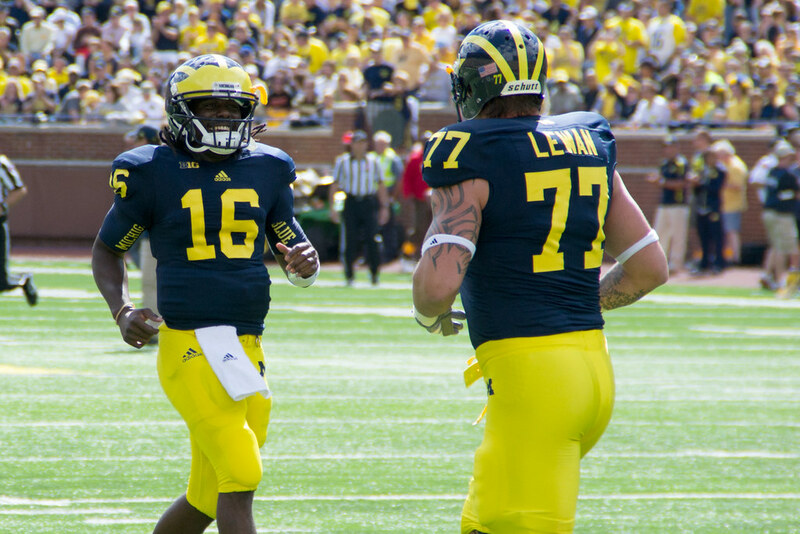 Denard Robinson accounted for all but seven yards of the team's total offense. The defense ceded 417 total yards—290 on the ground—and failed to keep contain all afternoon. Hail to the Air Force Academy. I'm sort of glad that Air Force put up a good fight. My father and grandfather are veterans, another close family member graduated from the Academy, and I have a strong appreciation for those in the military. They don't deserve to be embarrassed anywhere, including on the football field. They should be proud of the way they played on Saturday. We knew after the Alabama game that the team was perhaps a bit overrated, but are people just forgetting that Air Force is a solid program? They didn't play Central Michigan yesterday; Air Force gave Boise State its toughest test at home last year and came within a whisker of beating eventual Big 12 Champion Oklahoma and Mountain West Champion Utah (both top ten teams) on the road in 2010. They're not a pushover. They run an unorthodox offense to perfection and are a true measuring stick for how disciplined your defense is; not necessarily the actual performance level. UMass (blown out by Indiana) is a pushover. A 31-25 win against them would be a massive cause for fear, trepidation and other bad feelings. After counting the victory kneels as team rushing attempts Robinson surpassed the entire team in total offense. Fitzgerald Toussaint didn't have the run blocking we thought he'd have but he also didn't create anything, leaving Denard as the only legitimate rushing threat left for Michigan. The offensive line must find a way to create gaps for the running backs or this offense will continue to rely on a single player, and Michigan will pay for it by the time Notre Dame rolls around. 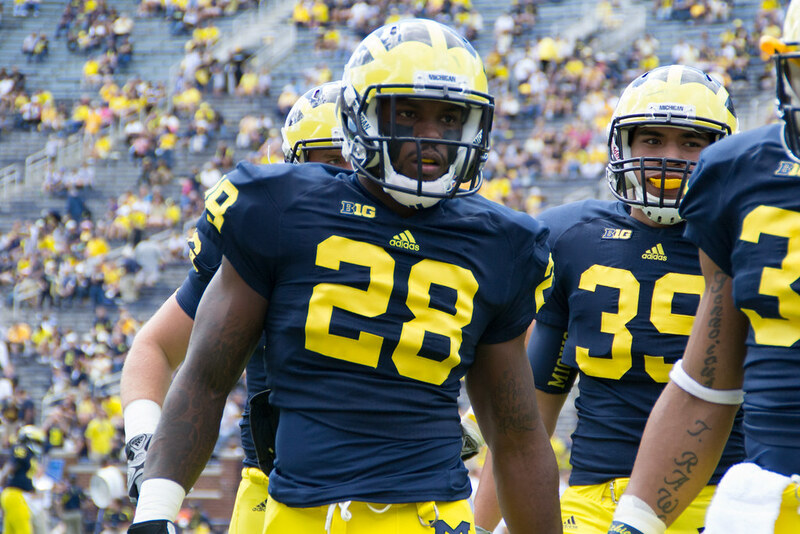 Photo Galleries from: MGoBlog, MVictors and UMGoBlog. Here was my view of the last 5 minutes of the game.